Home / Editor's Choice, Entertainment News, Gossip and Drama, Videos / Forget the one who was forced to eat pepper, See the punishment Mombasa residents gave this thug, LOL!!! Forget the one who was forced to eat pepper, See the punishment Mombasa residents gave this thug, LOL!!! Friday, February 8, 2019-Residents of Mombasa have devised new ways of dealing with thugs. A few days ago, a video of a thug being forced to eat pepper after he was caught stealing shoes in a mosque went viral. The man cried like a baby as a mob forced him to eat the pepper. Another one taken in the beautiful Coastal city has emerged and it's quite funny. 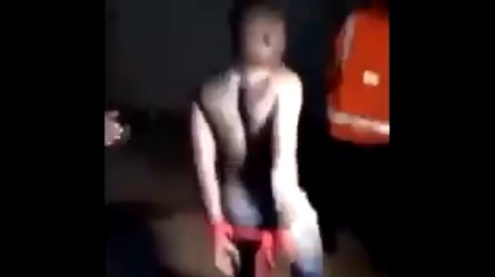 This one was forced to dance with his hands tied. Coastal peeps are special people.